What’s happening in those birdplane filled skies? Let’s talk turkey. The long foretold moment is nearly upon us, the server wipe. But fear not, those of you with keys to the Steambirds Domain, all is not lost; your gold, hangar slots, RC storage, unlocked planes, and stored crafting materials will not be wiped. Be sure to store items you want to keep in your RC storage! What will be wiped is your planes, your Pilot XP, and scrap. So you better spend that scrap! Following the wipe we will be having weekend (Friday - Sunday, starting 10 AM PST) closed beta tests to keep the game in tip-top shape and make sure that everything is well tested when we finally open the servers to the world at large! If you have a key, this’ll be your chance to explore the skies before the rest of the flock arrives, and gain the knowledge you need to help the Steambirds Alliance defeat the hordes of evil cats lead by Meowza. Eventually, the weekend beta tests will become open to the public, but that’s at least a few weeks away. Shotgun: -10% DPS at long range, and up to +55% DPS when fired point-blank (closer to +20% DPS at mid-range). Has not been applied to URs yet. 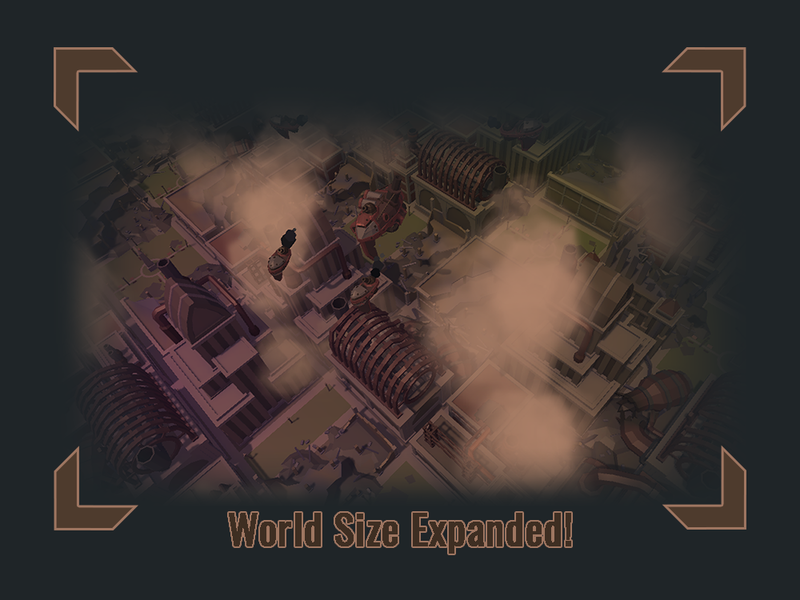 Bigger island: Landmass increased by +50%, setpiece boss population +35%. This is in preparation for open beta, when servers will be fuller. Super Secret Base: Made non-boss versions of Omega squadron, spawns as normal enemy in. The Vaults: Removed outdated warnings about X-Mines. Fixed chat / maneuver exploit. Fixed more of the keybinding bugs. Difficulty parameters tweaked. Intended result is, brand new players find the game a bit easier, and ultra-pros should find the game a bit more difficult. Negative difficulty scaling nerfed; should in theory stop giving unneeded help to veteran players with lots of skills and items. Duster spin attack: Now works with Elementals and Ultra Rares. Duster spin attack: Raised low tier damage, lowered high tier damage. Engineer turret: Bullet speed increased 2x (range unchanged), turning speed increased +33%. We’re back for the third week in a row with another update! This update is primarily focussed on more polish and bug fixes to help you with your all your Steambirding needs. We hear Parker over in the pub is looking more snazzy than ever and keen to see you again! No longer possible to double-interact with items in storage. Reordered friends list context menu. Fixed issue preventing players from being unblocked. Teleport to Rebel City defaults to back/share on controllers. Secondary fire now on right bumper/R1 on controllers, as well as face button. Modifier text on keybinding is more visible. WAR IN THE SKY: Bird Rebels vs the Feline Empire! Steambirds Alliance is brought to you by Spry Fox, co-developer of Realm of the Mad God, the first-ever MMO shmup.